Chevrolet and the Detroit Red Wings are a perfect match. Both are based in the Motor City and share the same commitment to innovation and excellence. So, it was a no-brainer when Chevrolet became the official vehicle of the Detroit Red Wings hockey team in 2015. 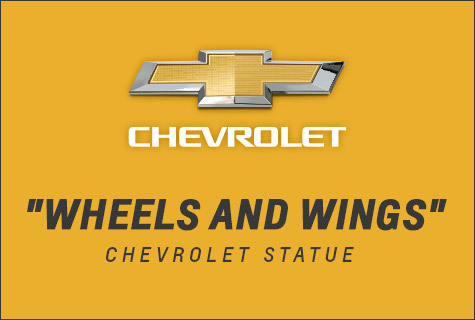 Chevrolet has stepped up their support of their home team, though, with a new Wheels and Wings statue at the team’s new home: Little Caesars Arena. Set to be permanently displayed at the arena’s northeast entrance, Chevrolet’s “Wheels and Wings” is a celebration of tradition, strength, unity, and invention. Measuring 9-feet 5-inches tall, the sculpture makes a bold statement at the entrance of the new arena. The massive work of art was crafted by former motorcycle stunt rider Tomas Vitanovsky and is partially constructed from disused Chevrolet parts, including a hubcap from 1918. The statue joins the old with the new, and you’ll also find parts from the 2018 Suburban, Tahoe, and Spark, the 2009 Kodiak, the 1996 Caprice, and more. Vitanovsky, a Czech Republic native, worked more than 700 hours creating the stunning industrial statue and used 186 parts from various Chevrolet vehicles. The result is a breathtaking work of art that pays proper tribute to an excellent team, an incredible community, and an innovative automaker. To learn more about Chevrolet’s ongoing commitment to excellence, come by Bradshaw Automotive today and take a test drive! Chevrolet brought their series of Red Line concept cars to SEMA, but released images and details on the vehicles beforehand to build up excitement and anticipation for the lineup. The diverse concepts include the Trax, Malibu, Camaro, Colorado, and Silverado 1500, in addition to the upcoming Chevrolet Spark RS concept. The Chevrolet Red Line concepts debuted November 3rd at SEMA. The Red Line series was designed to show off the customization and personalization capabilities of Chevrolet’s 2016 lineup, and the Red Line upgrades will be available for vehicles in that lineup. The Red Line series upgrades include a new Enhanced Silver Metallic color palette option, Charcoal roof panel, and accents in red and Satin Graphite. Most of the changes will be purely cosmetic, so while the price has not yet been announced, they are expected to be rather affordable. The 2015 SEMA Motor Show takes place in Las Vegas from November 3rd through 6th, drawing a crowd of over 60,000. Chevy is using SEMA to gauge interest in the Chevrolet Red Line concepts, but are confident that Chevrolet Accessories will become a quality alternative to aftermarket parts when it comes to personalizing their vehicles. 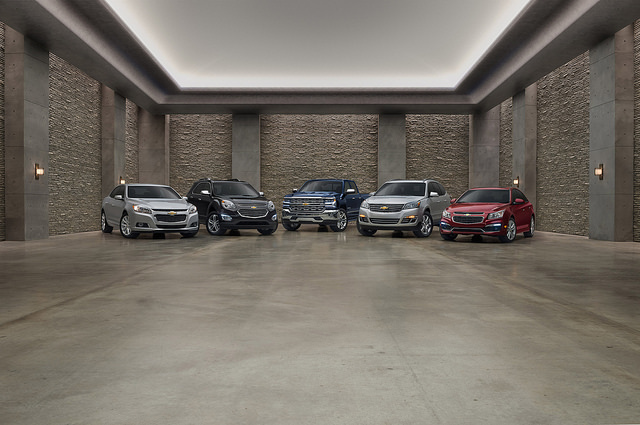 Share with us your thoughts about Chevy’s line up for the SEMA show! Chevy is celebrating its sponsorship of the MLB by putting a Corvette and Silverado right behind center field at Comerica Park in Detroit. Tigers fans were thrilled to see the redesigned Comerica Chevrolet Fountain, which puts two of Chevy’s favorites on display for an entire season. After hours of hoisting the cars in place with a special crane, they’ll now be visible for more than 3 million expected visitors. 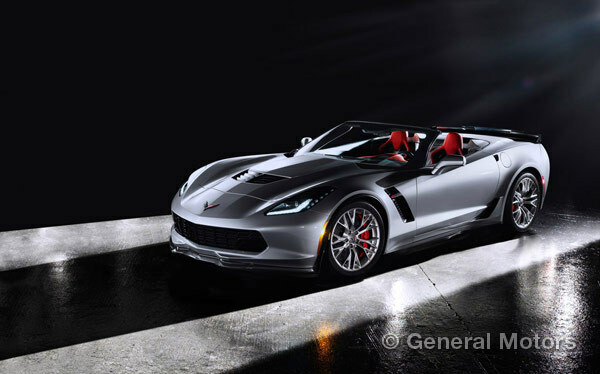 According to Chevy, the Corvette Z06 and Midnight Edition Silverado were specially chosen to represent the brand this year. 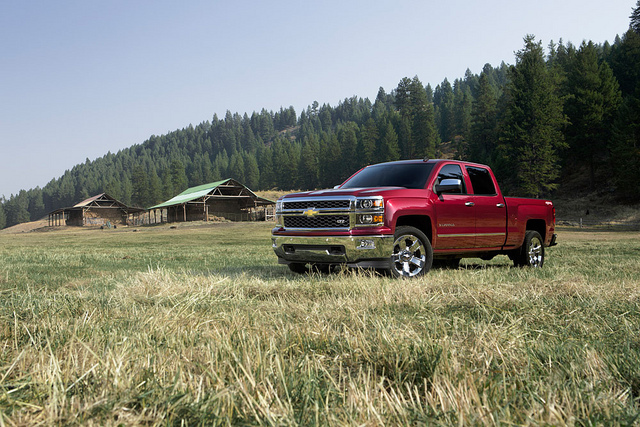 Both represent Chevy’s commitment to quality, highlighting rugged capability and high-octane performance. The fountain also has a host of water displays and sound effects for any time a player from the home team hits a homerun. We at Bradshaw Chevrolet just hope they don’t put any dents in the two display models. For the 2016 model year, the Chevrolet Malibu will also be offered as an electric, which we at Bradshaw Chevrolet have now learned will be powered in part by technology developed for the 2016 Chevrolet Volt. That can only be a good thing as we’ve learned at Bradshaw Automotive, because the Volt is an exceptional vehicle when it comes to electric technology. We have high expectations for the new 2016 Chevy Malibu Hybrid. Some of the borrowed parts will included a modified two-motor drive unit, which will be mated to an all-new, direct-injection 1.8-liter four-cylinder engine as part of the Malibu Hybrid’s powertrain. That’ll give it a total output of 182 horsepower and the ability to go up to 55 mph on electricity alone! The two vehicles also share power electronics and a blended regenerative braking system, which stores kinetic energy produced under braking into the battery system. The Malibu Hybrid will offer an estimated fuel economy rating exceeding 45 mpg, which is higher than the competing hybrid variants of the Ford Fusion, Toyota Camry, and Hyundai Sonata. Tell us what you think of the new 2016 Chevrolet Malibu as an electric vehicle here at Bradshaw Automotive as we wait for it to come into stores! “I have a video I want you to watch, and no matter what, I need you to stay focused. Don’t take your eyes off the screen,” starts the Chevy video “Eyes On The Road,” posted to the Chevrolet YouTube channel by Chevrolet Films. In a room with a video screen, several test-participants, and a proctor—who gave the aforementioned instructions—a video commences simulating the view one would see during a driving experience with a road and trees passing by. All test-participants are able to keep their eyes successfully on the screen. A repairman enters to noisily ‘fix’ an exit sign causing two people look over. Adorable barking puppies come in and one lady bends over to pet them. Meet the 2015 Chevy Cruz, Chevrolet’s answer for distraction-free driving in which drivers are able to send preset responses through the in-dash screen with the touch of a button, enabling their eyes to remain on the road. So be sure to visit Bradshaw Automotive, and keep your “Eyes on the Road” in one of our Chevy offerings! The 2015 Chevrolet Silverado 2500 HD pickup truck is available now at Bradshaw Chevrolet Buick GMC Cadillac in Upstate South Carolina! Long one of the auto industry’s top heavy-duty pickup choices, both American-made and worldwide, the Silverado 2500HD has been redesigned for 2015 with a hot new exterior and a refined interior. Available with either a gasoline or turbodiesel V8 engine (the latter of which offers a maximum towing capacity of 17,900 lbs.) and a wide variety of cab (Regular, Double and Crew) and bed sizes (Standard or Long Box), the Silverado suits drivers of all needs. Plus, the truck’s comfortable new interior offers better comfort and security, along with a long list of features that includes Chevy MyLink, a 4.2-inch Driver Information Center and an available rearview camera. 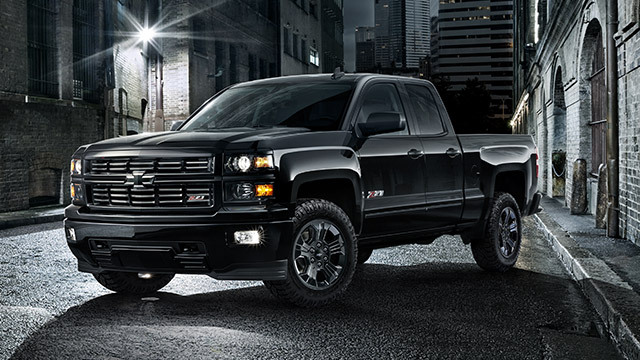 For a full list of models, specs and available features for the 2015 Chevy Silverado 2500HD, head over to Chevrolet’s website. We at Bradshaw Automotive are excited to announce that the first vehicles in the 2015 Chevrolet line are available now at our Greer, SC dealership! Stay tuned – in the coming weeks we’ll be highlighting several other new 2015 GM vehicles, including the Chevy 3500HD and Tahoe and the GMC Yukon! You can also visit our website to view our extensive inventory of 2014 Chevrolet, Buick, GMC and Cadillac cars, as well as our great selection of used cars in many makes and models! Don’t forget to follow Bradshaw on Facebook to participate in our March Madness contest to be entered to win a free oil change!